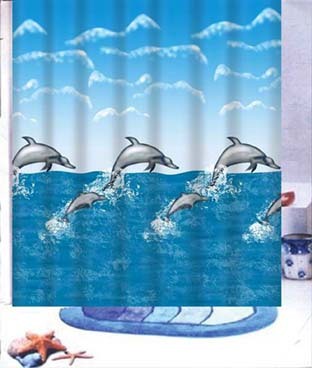 This beautiful Mother & Baby Dolphin Shower Curtain features gray jumping dolphins against a beautiful blue sky. Completely ready to adorn your bath or shower. Made of 100% polyester, it is water-resistant as well as machine washable. This shower curtain includes 12 rings and features a weighted bottom for a beautiful, seamless look.